LSD. No, not that, or even "Lucy in the Sky with Diamonds". I'm talking about the long slow distance run, like the one I did today. I've always wondered why marathon training programs typically top out at 32 km, so I looked into it. Here's what I found out. The training program I've referenced for all of my marathons comes from the Running Room and, like many other programs, the longest distance to run in training is 32 km (20 mi). But why this distance, specifically, and not something closer to actual marathon distance of 42.2 km? According to the interwebs (Matz, 2014; Runner's World, 2014), the general theory is: anything longer can increase the risk of injury. Recovery also takes longer with any runs over 32 km. Hanson’s marathon training method (Humphrey, 2011) also outlines that running for more than three hours means diminishing returns for runners, doing more harm than good by damaging muscles, compromising recovery time, and depleting glycogen stores significantly (Matz, 2014). Best to ignore that though, right? The above, however, I believe does not apply to me. According to a trainer I worked with when I first ran with Diabetes Canada in 2009, the long run pace for those looking "to complete" i.e. no specific finish time goals should be "between 8:30 to 9:30 minutes per kilometer...if you are going faster you stressing [sic] your body to the point that it can not [sic] recover by the next quality workout" (email from Team Diabetes Trainer, 2009). 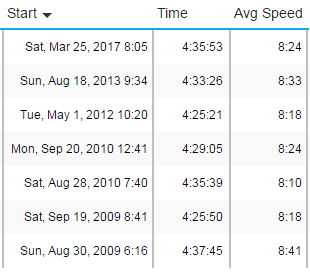 Doing the math, this works out to what is my typical finish time for these long runs which is around four and a half hours. In summary, looking at all the information as a whole: I dunno what the right answer is. What I do know is that, until I got the above information from a trainer, I had been running too fast (for me) on my long runs and was well on my way to injury and burnout. Her advice saved me in training for my first marathon, and I successfully finished that marathon without getting hurt. And - looking at my data over the years and having finished three more marathons since then, I'd say that advice has served me well over the years. Logically, I know there are slower runners than me out there; finisher information from all of my races has told me that. But where they are? I sure as hell don't know. I don't pass anyone when I'm out there; I am definitely the one getting passed. Sometimes this bothers me, but then I remind myself of the distance I'm running and I usually get over it. ...but then, what if they're running the same distance, only a lot faster than me? In those instances, I'm gonna guess that advice like Hanson's is for them. With six more weeks of training to go, I'm gonna stick with what I know works. That means, slow long runs, soaking my legs in cold water, foam rolling, rest and shorter runs throughout the week. This way, I know that I can recover adequately from week to week. No pushing past what is realistic for me. No comparing myself to others and what I'm reading on the internet (even though that can be really hard to do). And - if I could - I would run this marathon tomorrow, mainly because I'm sick of training. But since that's not possible, all I can do is stay vigilant, and hope for nice weather and strong runs based on my current fitness level. Today's run: 32 km. Weather: started out damp, but turned out to be partly sunny (thank you, Mother Nature!). Feeling: good. Confident. Which is freaking me out, a little. Not sure if I should embrace it, or wait for the other shoe to drop. Gonna try to let it go. 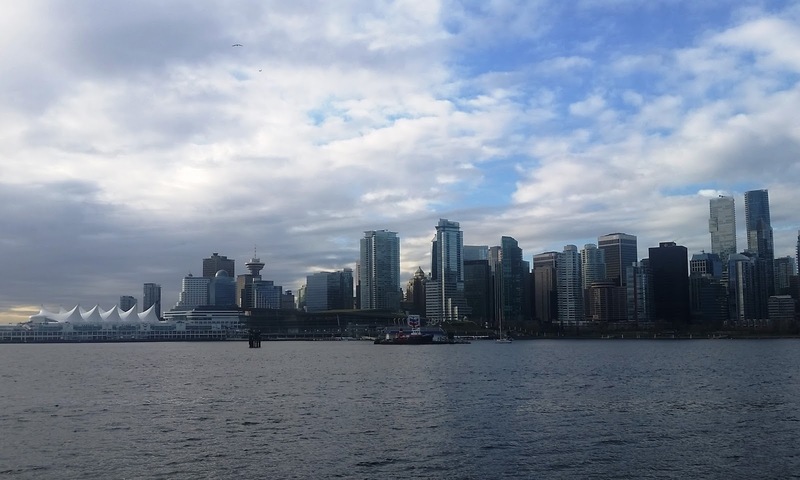 No rain looks good on you, Vancouver. Humphrey, L. (2011). Hanson’s Marathon Method: The 16 Miler. Hansons Running. Matz, J. (2014). How long should your longest run of marathon training be? WalkJogRun. Runner's World (2014). Forums Topic: Marathon training plans stopping at 32K.